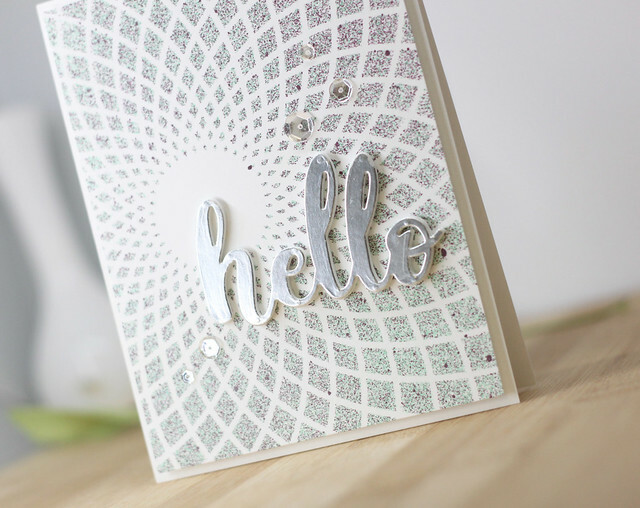 The rainbow Thank YOU is stunning and I LOVE the silver HELLO! Mesmerizing! Beautiful cards! That rainbow card is so cheerful. Guaranteed to brighten anyone's day! Gorgeous cards! I LOVE the sunburst stencil! Beautiful cards. The first is so classy and elegant. And I love the cheerful rainbow card. So lovely. I love the layered die cuts, and the pencil shaded card is worth the extra work! Love both your cards! the new stencils are all awesome. Just love this new release. Thanks for the chance. Love the cards!! I really like the look of Lagoon and Cosmic Berry together with the silver hello! Wonderful cards! Great techniques with the new stencils. 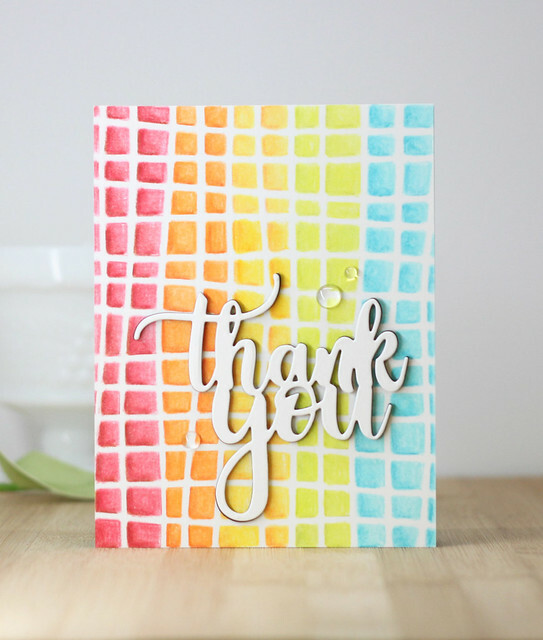 Love the card you made using the wavy grid! I really really love your sunburst stencil card. Great idea! They look great! I like the rainbow background. I loved the simplicity of the cards. Stunning cards! Love your style, Laurie. These are amazing, especially love the glitz of the first card..gorgeous!! Wow! I can’t imagine colouring all those squares! Fun release! You've done a fantastic job on both of your creative projects. I began the hop placing the Wavy Grid at the top of my "likes", and now, I really have fallen for the Sunburst stencil. Wow, so beautiful! Love the ink spray with the sunburst stencil, simple and stunning look. The rainbow grid is amazing with colored pencils, worth the effort and time. grey. The squares are fun. Mixing the colors was great. Awesome cards! I’m sure it took a long to color all those squares. I love your cards, this is another great release! Gorgeous cards, Laurie! Love your choice of stencils and colors...WOW! Both your cards are so beautiful..I love the happy colors on the second one ! 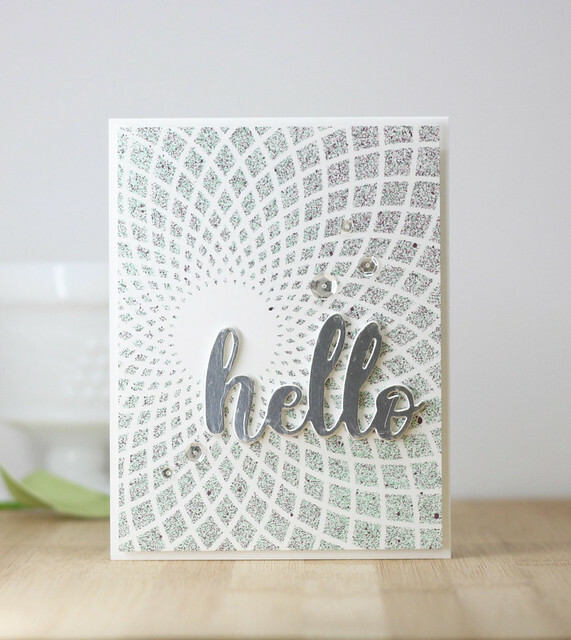 The sunburst stencil is one of my favorites so I was happy to see you use it to create a card. 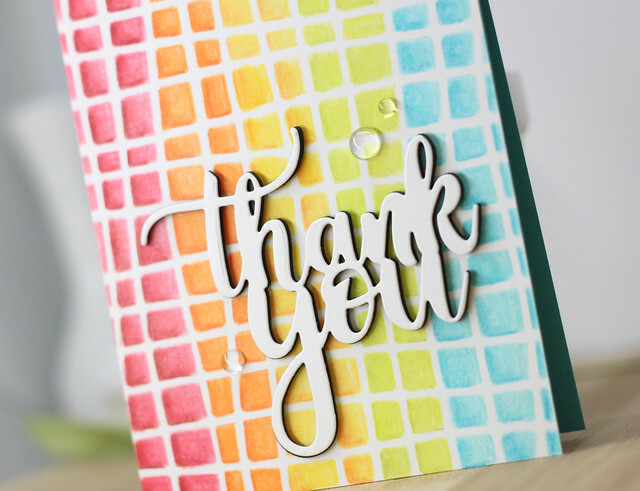 I loved the multicolored cards using the wavy grid stencil. It is gorgeous. Thanks for the inspiration. Wow, love both cards! The sunburst stencil is my favorite and I love how you combined the colors. The rainbow card is so fun. Thanks for taking the time to color all those squares! Your cards are beautiful! I love how you let the sprays and the stencil shine on the first card. I can not even imagine coloring in the other stencil, it is gorgeous! Great job! That rainbow card is perfection! Worth every minute you must have spent coloring it in! I'm just in awe of it! BEAUTIFUL! Beautiful, vibrant colors on your cards, the look of simplicity is a work of art. Love your cards. I LOVE your cards!!!! Thank you so much for sharing! Love these cards.. the background are just amazing . Wonderful and modern designs, Laurie, thanks so much for the inspiration! 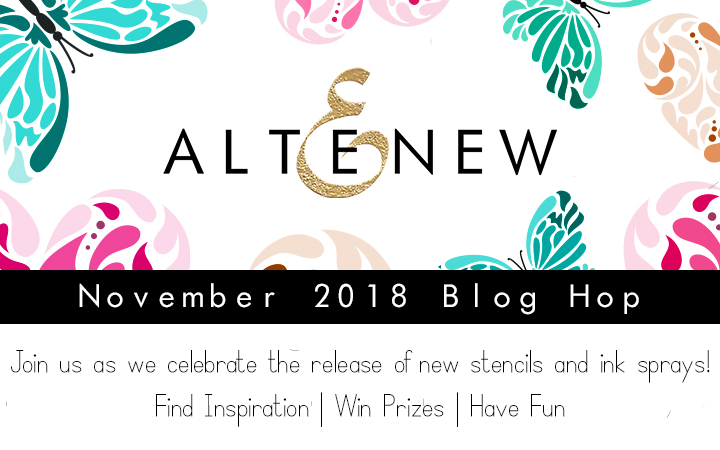 Both cards are lovely - great inspiration for how to use the new stencils. Love your clean look and especially love the rainbow card. Such pretty, contemporary designs! You make it look so easy to just spray color and shine onto the stencils to create great backgrounds. Thanks. Yep, not sure I’d have the patience to color in all those squares, but I love the effect. The first card is very pretty, too. I like the mixed sprays. Love, love, love your cards. That first card is stunning. And I am definitely using your idea of coloring through the stencils. I figure you can create a ton of these, just sitting watching a movie and coloring. The rainbow card is so beautiful. That's my favorite!! Both cards are awesome!! Cardboard boxes are a must when using sprays of any sort. What a great outcome on your cards! Beautiful cards. Your use of color on the second was amazing. I didn't realize you could do that with a stencil. Thanks for sharing these wonderful cards! Such pretty cards using the new stencils! Wow, love both cards! The rainbow is great (I always love rainbow), but the first card has taken the top spot for me - just love the look! I like both of these stenciled backgrounds! Both Stunning! Simple but elegant. Great cards! I love the Sunburst stencil sprayed with 2 very different colors. Nice affect! I think the Wavy Grid was totally worth the time to color it in! Sometimes you just get in the groove and the time goes by fast. You achieved a lovely result! These are great cards! The first is lovely with that stenciling paired with the metallic-looking sentiment and your second one is so bright and cheery! Love these stencils! That first card is just so stunning with all the silver and the sparkle! I enjoyed seeing these dazzling cards!! Thanks for sharing. Okay, so when I saw your first card, I thought for sure that it was a silver glitter paste that you had used through the sunburst stencil. I thought I had read wrong when you said it was Cosmic Berry and Lagoon, because it was reading so silver to me in your photo. It's still kind of messing with my mind, which just makes me love the card that much more. Thanks for sharing with us! Love these cards, especially the first one. Like the previous comment, I also thought you used silver in some way. In any case, it is absolutely gorgeous. Such wonderful cards! Love the stencils!! Wow I love these stencils especially the clear ones. Great job you are talented. You are such an inspiration, thank you so much! I am new to the arts and crafts scene, luckily I have a fantastic best friend that came along to teach me about doing crafts, making art, and helping me to find inspiration. By the way, Merry Christmas and I hope everyone has a good holiday!! Love the use of the stencils. I really like the backgrounds! So pretty, vibrant & fun, you seem to have had lots of fun making these. Gorgeous. All these new stencils are wonderful -- I think my favorite is the Sunburst and that card is amazing. These stunning backgrounds are perfectly paired with the simple sentiments. Love the palette on the first card. Lovely cards that are simple but so vibrant and cheery! I'm impressed that you coloured everything in with colour pencils! I hear ya on the messy crafting but sometimes it's just worth it and both cards qualify for that lol. Both are awesome but that first one is GORGEOUS with the shine and sparkle, I love it! Thanks for getting messy and passing on some great inspiration. Love both the cards, the stencils are awesome. Sunburst stencil is awesome, the glitter spray gives a lovely effect.